There is a long held stereotype within the metal world that one of its more consonant and accessible sub-genres, namely power metal, is a monolithic synthesis of hook-driven, flashy 80s influenced fair with a faster tempo and fantastical to the point of cartoonish lyrical subjects. While the charge of excess is one that any variant of metal would openly celebrate, the notion of a one-dimensional approach is a laughable one when the number of bands encountered goes beyond four or five. Of particular note is the somewhat lighter and prog-influenced variation that one might refer to as Sci-Fi metal, namely a subset of the Euro power metal revival dealing predominantly with space travel and featuring a spacey, almost ethereal combination of ambient keyboards and a lighter shade on the Helloween approach that was pioneered to a large extent by Stratovarius’ earlier 1990s output, and 1992’s Twilight Time in particular. This sound was further developed and given an even lighter and more cosmic twist by the subsequent efforts of outfits like the short-lived Portuguese symphonic outfit Oratory, as well as Russia’s Ghosthill on their first two LPs and the ongoing, 80s New Wave infused offerings of Keldian. Perhaps one of the more unlikely candidates to adopt this lighter and loftier approach is Sweden’s Cryonic Temple, a band that was better known during the latter days of the millennial power metal revival as a swords and sorcery outfit after the likes of Steel Attack and The Storyteller, with maybe occasional interludes into social commentary. Nevertheless, following a long period of studio silence after the modern, groove infused flop that was their 4th studio offering Immortal, that is where long founder and guitarist Esa Ahonen and his newly recruited lineup found themselves when 2017’s Into The Glorious Battlecame into being. Though there was an unmistakable familiarity to the game of speed metal infused majesty and noodling guitar leads that characterized said album, there was a notably spacier and more symphonic atmosphere afoot, one that played in quite well with the outtake to the final battle scene of Star Wars: Rogue One that was the album art. The biggest departure in sound, however, came in vocalist Mattias Lilja, who had a deeper and more nuanced vocal delivery that was about as far removed from Johan “Glen Metal” Johansson’s wild, Dickinson-inspired banshee wails that many core fans of the old days haven’t accepted. 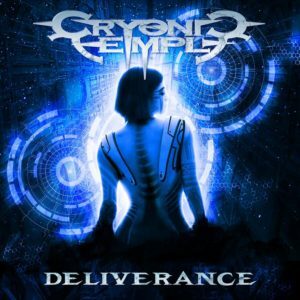 With a cover more befitting Tron: Legacy than anything in the Star Wars franchise, one might think that Cryonic Temple’s quick follow up in Deliverance would change things up a tad bit, but overall it plays things very close to where they were a year prior, so much that one might rightly speculate that this material was written during the same sessions as the previous album. It’s naturally not a full out carbon copy, as Lilja does expand upon his somewhat mid-ranged, moderately gravely croon to include a bit more attitude, not to mention a commendable attempt at channeling the iconic Halford shriek during the chorus of the title song “Deliverance”. Likewise, the harder-edged speeder “Pain And Pleasure” goes back to the good old days of In Thy Power by laying on the riffs a bit heavier and also features a guest lead vocalist who sounds a good bit closer to Glen Metal’s bygone gritty shouts. Yet as an overall package, this album relates back to its immediate predecessor in much the same fashion that their first three albums did to each other, emphasizing a degree of stylistic consistency and precision that make it all but impossible for anyone who liked Into The Glorious Battle to dislike this one. It’s a rather curious thing, but in spite of being dominated by this atmospheric feeling of floating in zero gravity amid the stars, this is an album that wants for little in the impact department. Following the shimmering strings and thematic beauty that rounds out the introductory instrumental, Cryonic Temple grasps back into the late 80s well of Helloween and comes out with a rather obvious though unique nod to “Eagle Fly Free” in “Rise Eternally Beyond”, complete with a bass vs. guitar vs. drums solo duel at its climax. Similarly enthralling excursions through flashy, speed metal territory emerge in the riff happy Judas Priest homage “Knights Of The Sky” and the warp speed thrill ride “Starchild”. Likewise, when things take on a more mid-paced flavor as on “Under Attack” and “Through The Storm”, there is a strong, chunky guitar assault that manages to punch through the airy keyboards and gives things a bit of an Accept feel, while more keyboard-dominated mid-tempo anthems such as “Temple Of Cryonics” and “End Of Days” deliver some truly massive, hook-happy choruses and see Lilja putting a bit more gusto into his vocal delivery. Truth be told, minus the somewhat sappy and dispensable ballad “Loneliest Man In Space”, there isn’t really an outright weak moment to be found here. During an interview for The Black Sabbath Story Volume II: 1978-1992, the now departed legend Cozy Powell noted something along the lines of every fan having an era of Sabbath (of which there were many by 1992, let alone after) that meant something special to him/her, implying that no one era of said band was necessarily better or worse than the rest. While many die-hard Ozzy and Dio fans would fight to the death against this notion, there is a certain wisdom to it that is applicable to Cryonic Temple’s evolution as a band. Some will likely continue to see this band’s name as implying a throwback to the days of yore when chivalry and jousting duels were the norm that was cryogenically frozen and then revived in the early 21st century, which was the gist of their sound prior to the release of Immortal, but this need not imply that there is no room for a new interpretation of a lone person from the past being frozen by the same means and then awakening to a different world in the distant future where the conquest of the stars is underway. For those who are capable of treasuring the past and also hoping for the future of power metal, Deliverance is the right album at the right time, whether the implied year be 1099 or 2199. This entry was posted in Bands, Featured Review, Power Metal, Reviews and tagged Cryonic Temple, Deliverance, Esa Ahonen, keldian, Oratory, power metal, Scarlet Records, Stratovarius, Sweden.